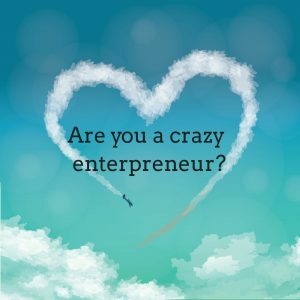 You are here: Home / Blog / Do You Have to Be Crazy to Be an Entrepreneur? When I say crazy, I don’t mean psychotic. I also don’t mean what your family and friends may call you when you say you’re going to start your own business. I mean being willing, in fact, eager, to step off the beaten track of the nine-to-five corporate track and explore the road that is not only less traveled but maybe not traveled at all. That’s why you have to be a little crazy. The crazy thing about this dream is that it takes over. Your vision has more power than all the warnings you got about risk taking. Your dream inspires you. It gives you all kinds of ideas. It may involve creating a legal nurse consulting business that caters to plaintiff attorneys. It might Involve studying to be a life care planner. You live and sleep it. You may be exercising, and you get a great idea. You can’t wait to be finished with your exercise program so you can run with the idea. This is the area where the world may call you crazy. Imagine thinking that the world is round when everyone can see that it’s flat. Imagine thinking that invisible things can cause disease. Imagine believing that you could build a heavy machine and make it fly. Whoever thought those things were crazy. This should make you feel better because, no matter how wild your ideas are, they don’t come close to these ones. This may be the craziest idea of all. Who do you think you are? You’re one person. You have flaws and limitations. How are you going to succeed where so many have failed? This is also the most important concept when it comes to becoming an entrepreneur and remaining one. It’s where so many would-be entrepreneurs falter and fail. You can have all the dreams. You can have an imagination that never quits. Dreams and imagination, though, have to have a place to land. They can only find a home in the heart of a person who believes enough in herself or himself to bring them to life. If you have faith in yourself, that’s you. And that’s the best kind of crazy. Pat Iyer helps crazy legal nurse consultant entrepreneurs launch their business so they glide away from having someone else tell them what to do, when to work and how high to jump. Would you like to talk with her about your dreams and how she can help you? Sign up for a one on one exploratory call with Pat. Would the help of an experienced LNC coach help you grow your business? Let’s find out. Let’s talk about how we can work together to help you soar. This is good and inspiring information. Thanks for the compliment, Tracy. I appreciate it.